"..The Model 1440 Calculator uses state-of-the-art MOS/LSI (Metal oxides substrate/large scale integration, MSI (medium scale integration, SSI (small scale integration), and discrete semiconductor circuitry. The calculator consists of three major areas: input, central processing unit (CPU), and output. The input consists of an array of switches house in the keyboard. Closing one of the switches causes a "Start" signal to be generated, and the unit responds accordingly. .."
* This was found to be bad - looking for a replacement! 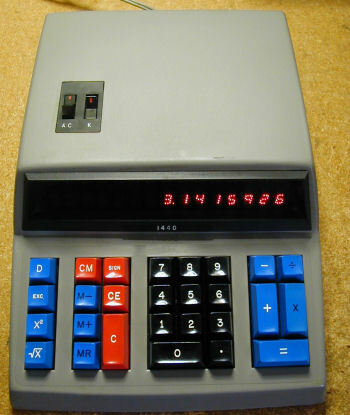 There is an article about this calculator kit in the July 1973 radio electronics. Here are some photos for your collection. One shows the insides with a DIP cable plugged in for the ROM. it. One shows the calc from the outside. That was the last photo I took. it more in the center to clear the switches.